Make a run on Archives. If successful, instead of accessing cards, add Political Graffiti to an agenda in the Corp's score area as a hosted condition counter with the text "This agenda is worth -1 agenda points. Trash Political Graffiti if the Corp purges virus counters." If the Runner adds Political Graffiti to an AstroScript Pilot Program, is the AstroScript worth negative 1 agenda point or 1 agenda point? It would be worth 1 agenda point. If the Runner adds Political Graffiti to a Project Beale with an agenda counter on it, how many agenda points is the Beale worth? Project Beale will have +1 and -1 point, so it will be worth 2 agenda points. The Runner makes a run with Political Graffiti when the Corp has a Hostile Takeover and no other agendas in their score area. During the run, the Corp rezzes an Archer, forfeiting the Hostile Takeover. What happens when the run is successful? Political Graffiti’s "if successful" ability is not optional, so resolve as much of it as you can. When the run is successful, there is nothing to host Political Graffiti on, so the Runner does not access cards, and then trashes Political Graffiti once the run ends. The Runner steals a copy of Breaking News, uses Turntable to give it to the Corp, and then plays Political Graffiti on that Breaking News. Is the Corp allowed to play Punitive Counterstrike on their turn? The Corp can always play Punitive Counterstrike because it always initiates a trace. But if no other agendas were stolen during the Runner’s turn, Punitive Counterstrike would not do any damage. The Runner applies Political Graffiti to an Accelerated Beta Test. Later, they steal a Domestic Sleepers and use Turntable to swap it with the Accelerated Beta Test. How many points is the Accelerated Beta Test worth? The Accelerated Beta Test is worth 1 point. While cards in the Runner’s score area are inactive, cards hosted on them can still be active. This card is actually a cute little tool. While it does not hold its weight in normal scenarios (as the review by Gerrak shows) there is one application that has been overlooked so far. Playing it mid-game only has a minor effect, because the Corp can just spend one turn of purging or using Cyberdex Virus Suite. However this card would be rather good if it did not have that weakness. And that's the point I'm trying to make: If the corp cannot purge, this card can cause an upset. This happens in tournament games that go to time. Suddenly if you were behind in a very long game with something like 5 to 3 points for the Corp you can win on your last turn by using three copies of this card. This assumes that first the game goes to time at all and that time is called on the Corps turn. Also you can hinder the corp if time was called on your turn and they would win by scoring a 1/2/3-pointer on their turn. You can get into these situations if you're playing an econ-denial deck or you're up against a Museum of History deck. This applies to Gagarin-Museum and to a lesser extent to IG-Museum. IG does cover their archives regularly but is likely to prefer one or multiple copies of Crick to defend it. If time was called you might be able to let them install a card - assuming they don't have a copy of CVS in there. So this is very niche but in some cases powerful tool. It might be a silver bullet for long Glacier or Museum games. The rest is said better in Gerraks review. What an interesting card! "Interesting" does not necessarily mean "good," so let's take an in-depth look at the card and see where our opinion lands. If we reduce the card down to its barest interaction, devoid of context, you're essentially paying one click and one card to bring the corp's agenda score down by -1, since most of the time the corp doesn't ice up archives. Unless, of course, you're Noise, or they're Industrial Genomics, or the cards Keyhole/Security Testing/Sneakdoor Beta are on the field. -For Anarchs with MU issues, this may be one of the best ways of dragging out the game... In other words, halting Fast Advance decks. Best case scenario, they'll purge and destroy your graffiti when they're at 4 or 5 points, signalling that they more than likely have an agenda in hand. Worst case, they score all the points they need and then purge after, which buys you a single turn at most. Thankfully, this is FA we're talking about here. That single turn could very easily mean the difference between a win or loss. -Playing a second (or third) of these when one is already in the corp scoring area is probably a waste. Since a single purge is all it takes to get rid of all copies of Graffiti, unless -1 point isn't going to stop the win by itself, two or three of these is a overkill. Still, you using two or three clicks to make them use a whole turn isn't that bad of a trade, really. But definitely not a great one when you consider that you also used two or three cards on top of that. And even worse if they don't even use their whole turn and just whip out CVS. -On the note of CVS, this card doesn't seem all that good in an already virus heavy deck. For example, if you're Noise, or any other Anarch who'll obviously be using a ton of viruses (ahem), the corp is already waiting to bust that CVS out at the earliest opportunity to ruin your day and set you back. So since they're already counting on purging viruses, perhaps multiple times over the course of the game, you could almost argue you're wasting clicks and cards to encourage them to do something they were going to do anyway! 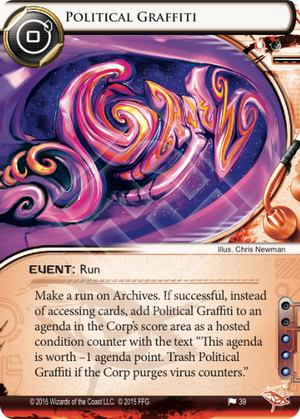 However, if this was in, say, a MaxX deck, where the only interaction CVS had was with Political Graffiti itself, the corp is probably likely to toss out such a card, thinking it to be useless. Thus ensuring three clicks will be devoted to getting rid of it. Nice. -It's an event. Not a program, or a resource, like Clot or The Source. This means you can use Same Old Thing to put it right back in the corp's scoring area as soon as they purge it. This also means that unlike Clot or Source, it has hardly any ways to tutor it, while those other two have so many, such as SMC or Hostage. It also misses out on the instant speed interaction that Clot has with SMC and Clone Chip. -This card has anti-synergy with Iain Stirling, depending on the board state. Which is funny enough in itself, but definitely begs the question: why on earth are you spending his precious few influence on this? -Finally, and most importantly/unfortunately, the corp can very easily not care about this card, even if all three are in their scoring area. This card doesn't close scoring windows or make them harder to open. It doesn't actually take away points they've amassed either really. It just makes it take a little longer for them to activate. Heck, if the corp's main plan is flatline, they'll just see this and laugh. This card hardly even exists until game point, and then at most it just makes the game take one turn longer than it would have. Which it might not even do, if in that last desperate glory run to score you hit a CVS, allowing them to win on your turn. Talk about painful. So far be it from me to render judgment over whether or not this card is "good," but from where I'm sitting, it ain't. In an Anarch deck it barely slows things down, and not even as reliably as their other in faction card, Clot. Outside of Anarch, you're barely slowing things down for a whopping three influence (or more)! I don't expect this card will see a lot of play. Perhaps some, but not a lot.